This baked goat cheese appetizer is super simple to throw together at the last minute. 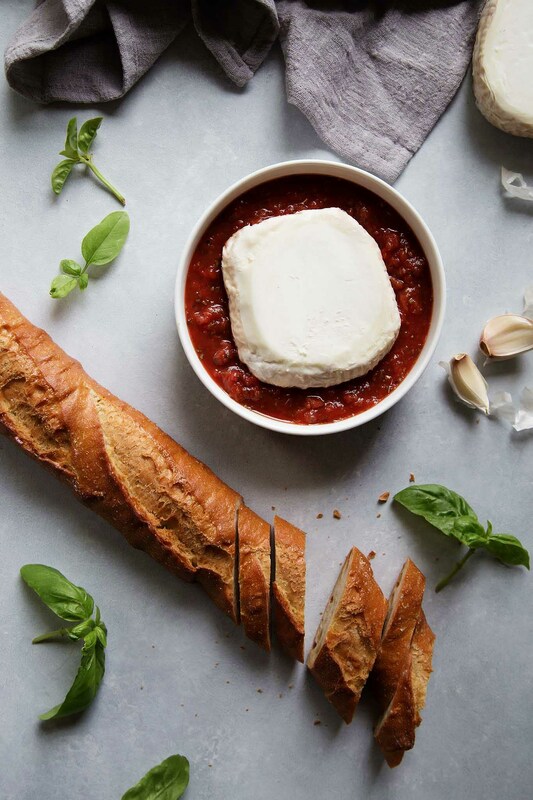 French goat cheese is baked in a marinara sauce until hot and bubbly – Perfect for spreading on crostini. With the holidays upon us, I think we can all use some quick and easy appetizer recipes in our arsenal, right? 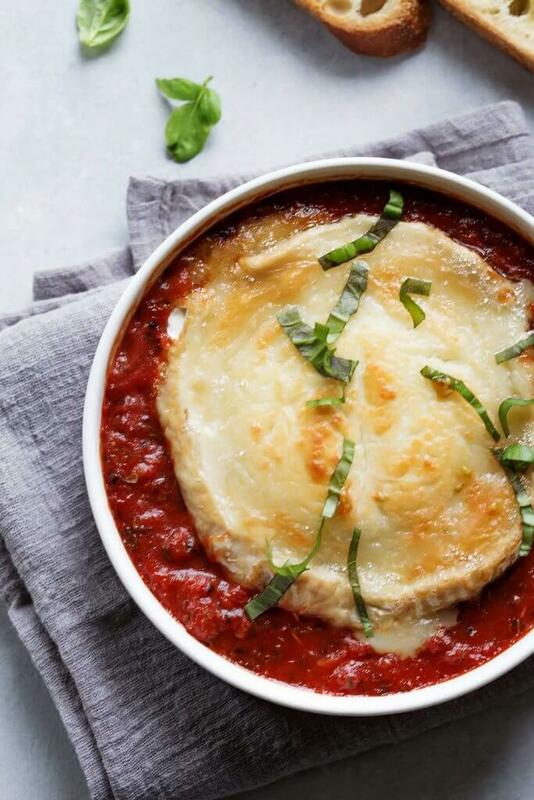 That’s exactly why I’m sharing this recipe for baked goat cheese in marinara sauce. There’s absolutely nothing complicated about this recipe. With no fancy ingredients, and very few steps, this is an appetizer recipe that’s about as simple as they come. Another highlight? 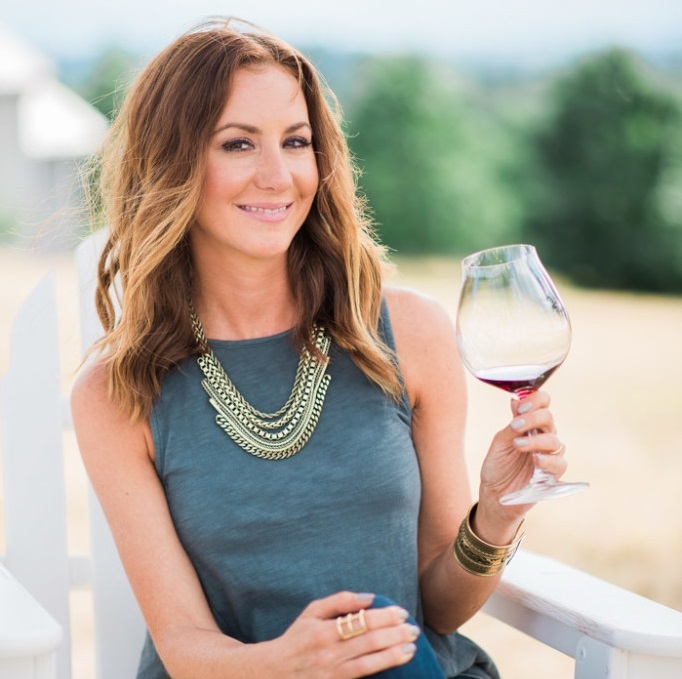 You can do all the work before your guests arrive. I made a simple marinara sauce by combining some canned crushed tomatoes with couple cloves of garlic and some Italian spices like oregano and basil. A pinch of sugar cuts down on the acidity a bit, and there’s no need to cook the sauce ahead of time, it will get nice and bubbly in the oven and all the spices combine perfectly as it bakes away. 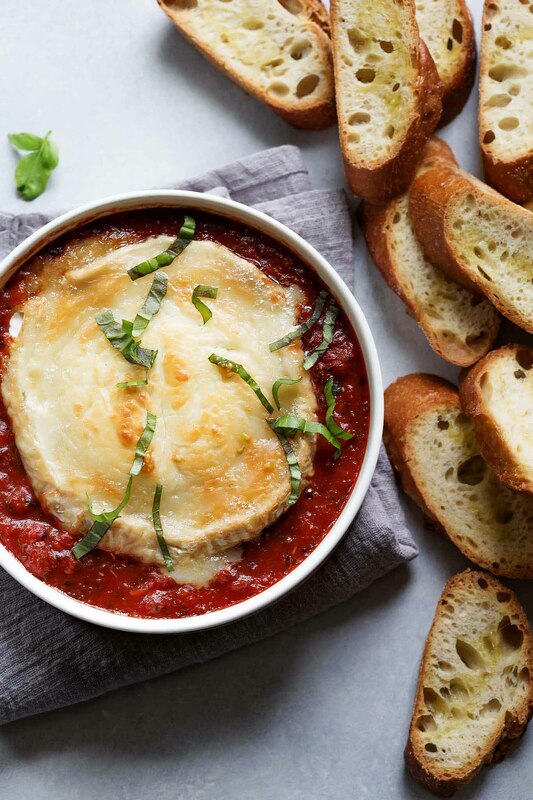 Note: You could also use some store bought marinara sauce in this baked goat cheese recipe, though I promise that whipping together this homemade version is nearly as simple. As much as I could simply eat this baked goat cheese appetizer with a spoon, I figured some crostini would be the perfect vehicle to load up with this creamy goodness. I just sliced up a baguette, drizzled it with some olive oil and let the crostini get nice and crispy by adding them to the oven during the last ten minutes of baking time. Once your goat cheese is nice and golden and bubbly, it’s ready to eat! I topped my baked goat cheese off with a bit of fresh basil for some added color and a bit of extra flavor, but you can totally skip this step too. This baked French goat cheese appetizer is guaranteed to wow your guests! Pair it with a nice bottle of Barolo or Chianti for bonus points. This baked goat cheese appetizer is super simple to throw together at the last minute. 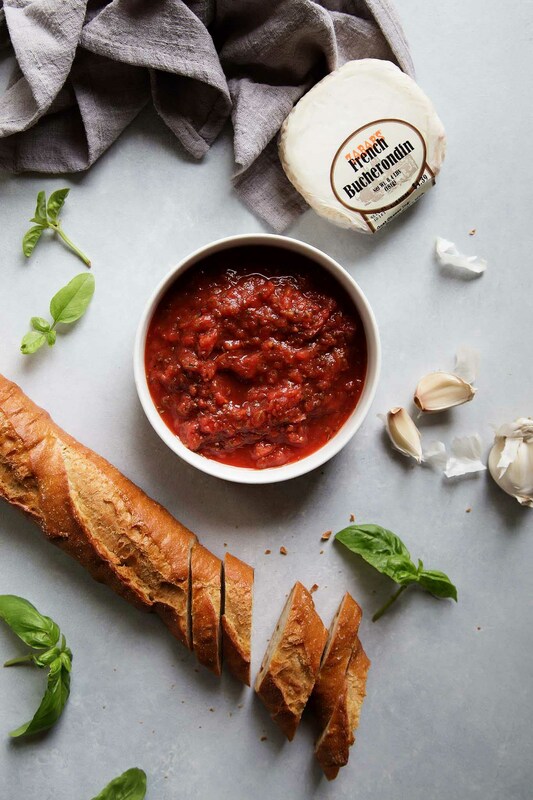 French goat cheese is baked in a marinara sauce until hot and bubbly - Perfect for spreading on crostini. Preheat oven to 375°F. 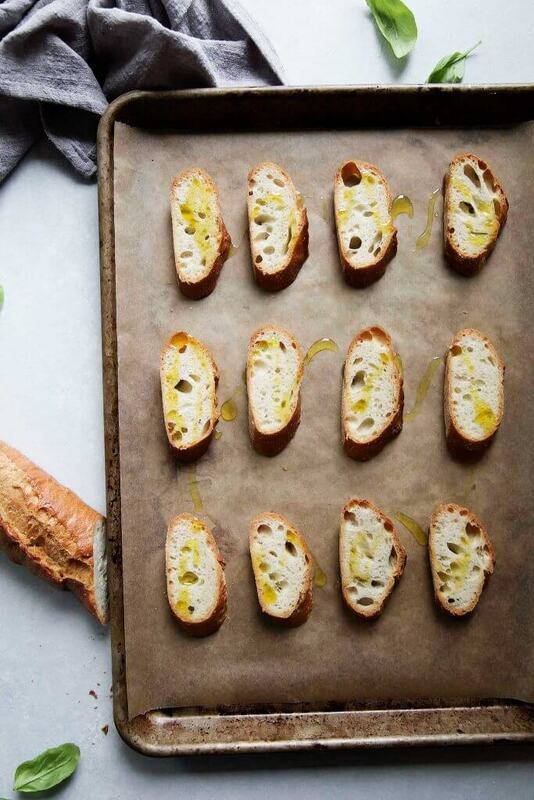 Place the baguette slices on a baking sheet and drizzle with olive oil. Set aside. In a bowl, combine the tomatoes, garlic, oregano, basil, onion powder and sugar. Place in a baking dish and top with the goat cheese. Bake, uncovered, until the sauce begins to bubble at edges and the cheese is hot, about 25 minutes. During last 10 minutes of baking, transfer the bread to the oven and toast until golden brown, about 10 minutes. Garnish cheese with basil, if desired. If you loved this goat cheese appetizer I would appreciate it so much if you would give it a star review! Also, be sure to snap a picture of your finished dish and share it with me on Instagram using the hashtag #platingsandpairings. Be still my heart. That looks heavenly. 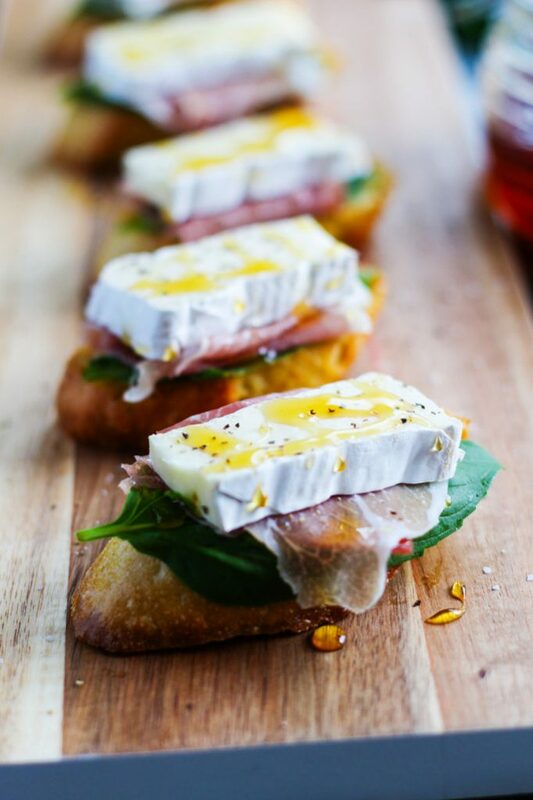 I’m a fan of anything goat cheese and this looks so indulgent and delicious. I’m defintley saving this to try out this holiday season. Yum! 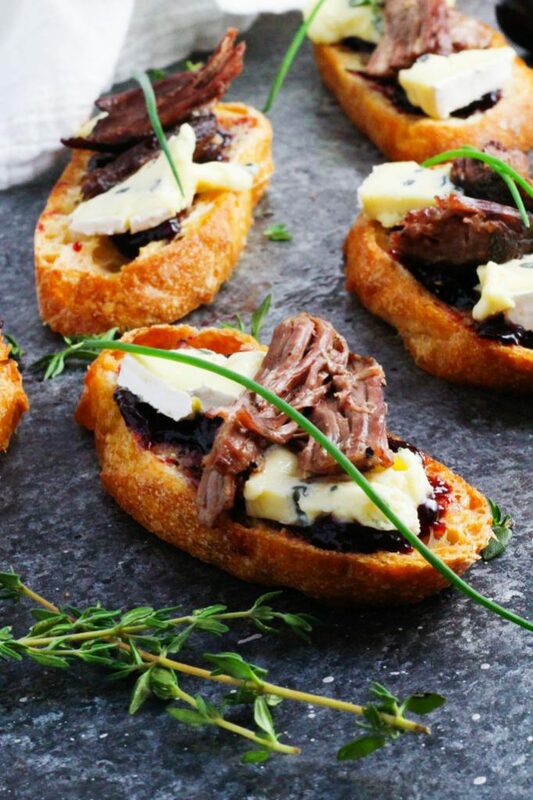 What a perfect appetizer to throw together for a holiday party! Definitely going to be keeping this one in my back pocket. Thanks Hillary – This is definitely a simple recipe that’s perfect for last minute planning! 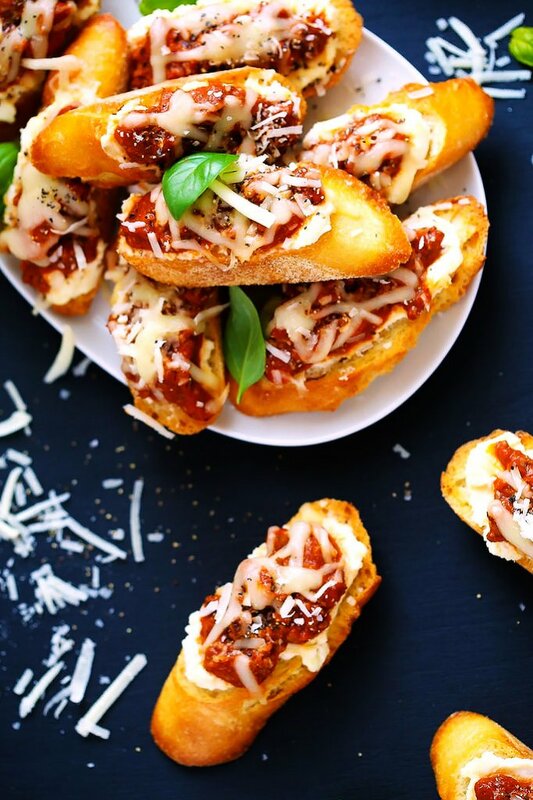 This is the kind of appetizer that I could seriously just sit down and eat as a meal. It looks SO delicious! Thanks Marlynn – I’m with you. I could call this a meal too, as long as I have a comfy couch, Netflix and a glass of wine I’m good! Sounds so good! And crazy easy. I will have to make this soon. Thanks!